Since our last update in mid-November, we have continued to make many small improvements to our website. Read on to learn more. We streamlined the Volunteers area, combining and improving the Schedule & Manage how-tos—activities, courses, clinics & seminars, events, and lodge stays—to reduce the number of items in the menu and decrease clutter and confusion. We created a Vision & Leadership area within our About menu to feature our Board of Directors and Advisory Council, and provide a home for our new strategic plan, Vision 2022, and Annual Reports. We updated blog categories to make it easier to find content relevant to your interests. Based on usability testing, we added additional cross-links to Youth, Upcoming Events, and Schedule & Manage to the Explore menu so that these items are where many often look first. We added Activity Overviews that are much like our Course Overviews so that everyone can learn more about the types of activities we offer, their difficulties, and participation skill prerequisites. 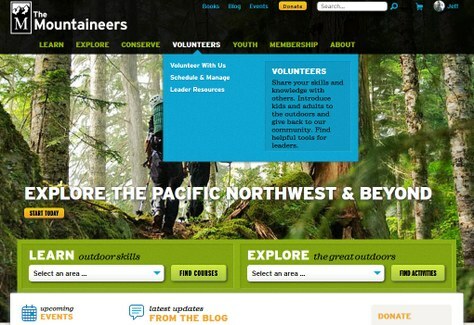 We added "Host & Volunteer" and capacity sections to lodge stay rosters. This will allow volunteers on the committee to use the "make a reservation" feature to more easily add themselves and any guests to lodge stays and pay for themselves and/or guests as needed. We added a "requested info" feature so that each lodge can custom tailor questions to be asked of each guest when making a reservation. We added the lodge stay start date (and the end date if different from the start date) to top of every lodge stay's team roster. We changed the links in the reservation portlet to "Log into your account" and "Create an account or join" to give new folks a less-intimidating path to participating. Learn more by reviewing How to Schedule & Manage Lodge Stays. We added functionality to allow us to retire Routes & Places where we no longer go because of a permanent access issue or for ones that are duplicated and need merged with another. Because it is a bigger project, we will add merging Routes & Places at a later date. We added fail-safes to prevent using routes and places are not yet ready or are retired. We fixed an issue that allowed a student to be registered for more than one course-related activity where there are multiple date/location options, and the student made it off the waitlist. If you're ever in the situation where you are registered for one course-related activity option and make it off the waitlist for another, you'll be required to choose which you prefer. We added the course start and end dates to the top of every course's team roster. We made it easier for parents to enroll their children in our adult courses by requiring our "Youth in Adult Programs" form be completed or updated as part of the course registration process. Children continue to need the permission from the course leader before registering. We changed the links in the registration portlet to "Log into your account" and Create an account or join" to give new folks a less-intimidating path to participating. We added a "My Trip Reports" page to your profile so you can easily find all the trips reports you create. We added the activity start date (and the end date, if different from the start date) to top of every activity's team roster. We reorganized and improved the activity add/edit form. The fields are now grouped and ordered in a more logical order. We also added a few new fields for our sea kayaking groups, and we improved the help text for many of the fields. We changed the links in the registration portlet to "Log into your account" and "Create an account or join" to give new folks a less-intimidating path to participating. We added the event start date (and the end date, if different from the start date) to top of every event's team roster. We improved the calendar display so that rich text can be displayed above the calendar grid. See this in action on our Upcoming Events calendar. We added the list of your guests to an event's RSVP portlet, so you'll more easily know who you may need to add or cancel from your group. We changed the links in the RSVP portlet to "Log into your account" and "Create an account or join" to give new folks a less-intimidating path to participating.